The Dana-Farber Cell Manipulation Core Facility (CMCF) renovation creates one of the largest facilities in the country dedicated to the research and production of personalized cancer treatments, providing novel cellular therapies for clinical settings through unique, all-inclusive research and manufacturing. 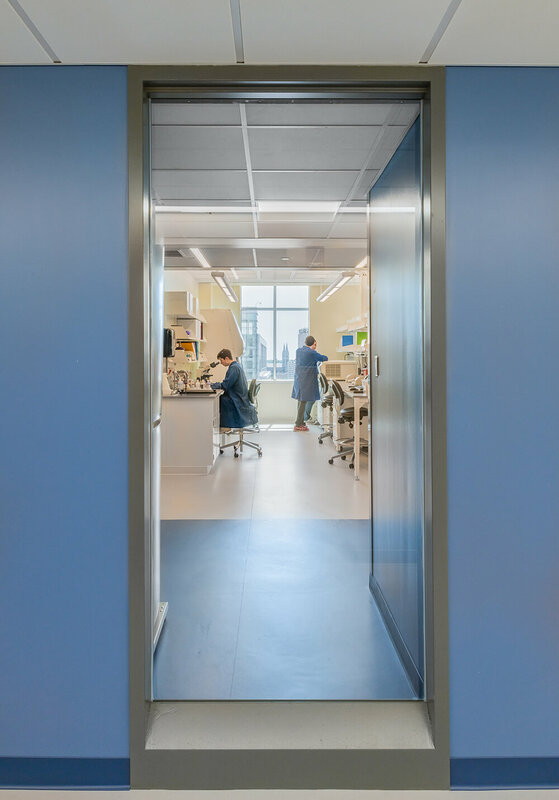 Designed to foster transparency and visibility, the two floor renovation transforms a windowless vivarium into a specialized research environment, incorporating unprecedented visual connections. The CMCF, previously spread across eight locations, is now centralized on the 11th and 12 floors of the Smith Building. 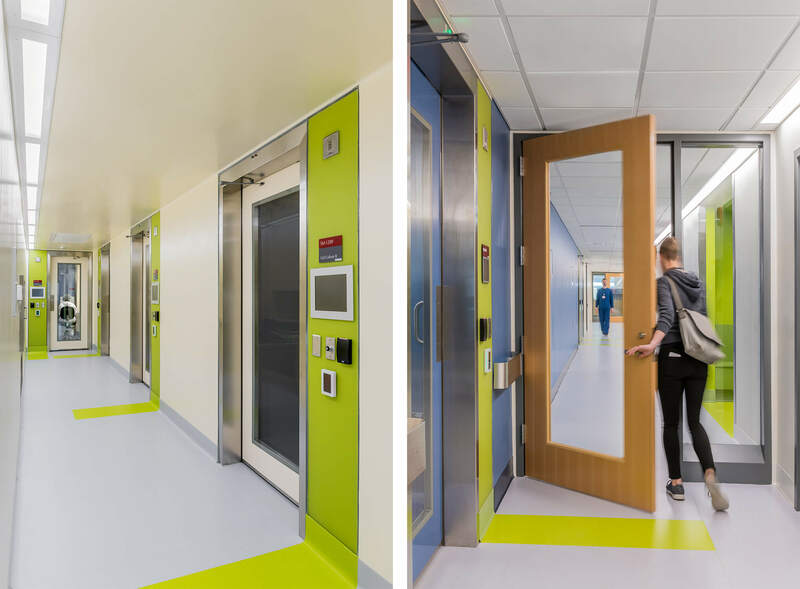 The design transforms a wide and deep floor plate, cluttered with multiple existing shafts, into an intimate open plan that belies its many-layered regulatory barriers and intense mechanical systems. The design intervention is organized around a series of thresholds and portals that mark transition, simplifying the visual environment and supporting the rituals of daily work. Often confusing windowless mazes, here we find clear visual axis and transparencies throughout. At each location, occupants move to elevated levels of cleanliness, signifying and reinforcing the protective environment. View corridors create connections from the middle of the floor plan to the exterior to give each user access to natural light. Though much of the program demands clean room controls, the design enlivens with color, framing views to the city beyond. Additionally, views through and into the cleanroom suites permit non-gowned management, regulatory and re-search staff to communicate with and assist those within. The careful attention to detail and craft exhibited through the project exemplify the intensity of the meticulous work within. Moving well beyond the myriad of technical requirements, the renovation creates a lively, humane and clearly understood plan that enhances the daily lives of its dedicated occupants. Researchers and staff within the clean room environments are afforded connections to daylight and the outdoors. These are essential to reducing the stress and improving well-being for people engaged in highly demanding technical tasks. This is no small feat given the classified particulate count requirements of the clean rooms. A nearly invisible double wall protects the interior environment and tempers environmental impacts, permitting exterior windows. These clean room exterior windows are a rare and important benefit for the staff. The careful attention to detail and craft exhibited through the project exemplify the intensity of the meticulous work within. 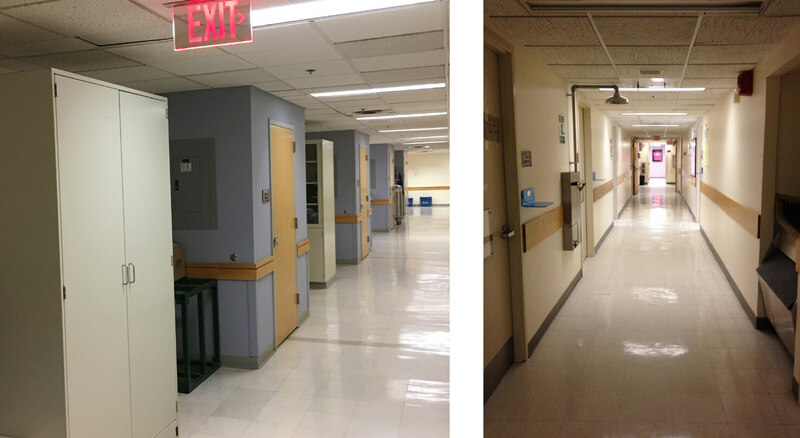 Left far too frequently to process regulations alone, the typical response to this program is a sterile and lifeless sequences of rooms that are in odd juxtaposition to their role in saving lives. 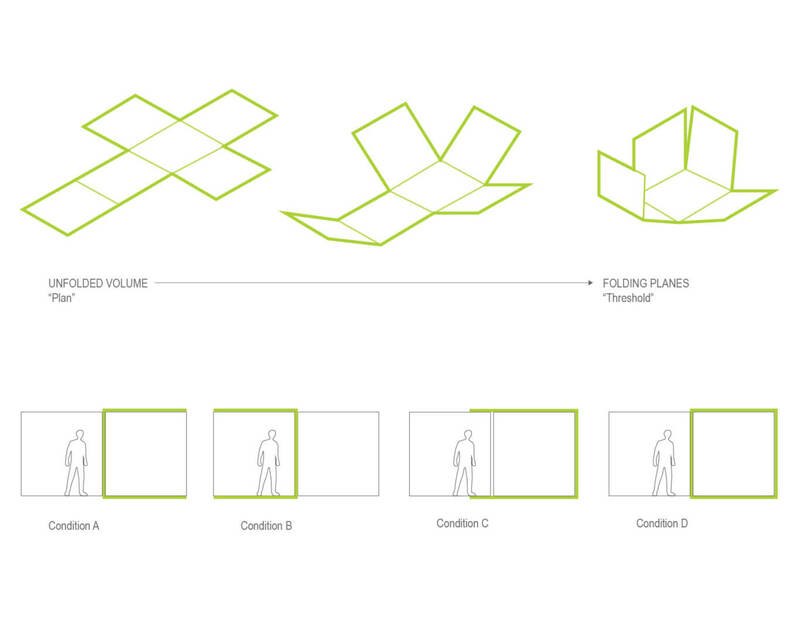 The design response is to humanize the space.